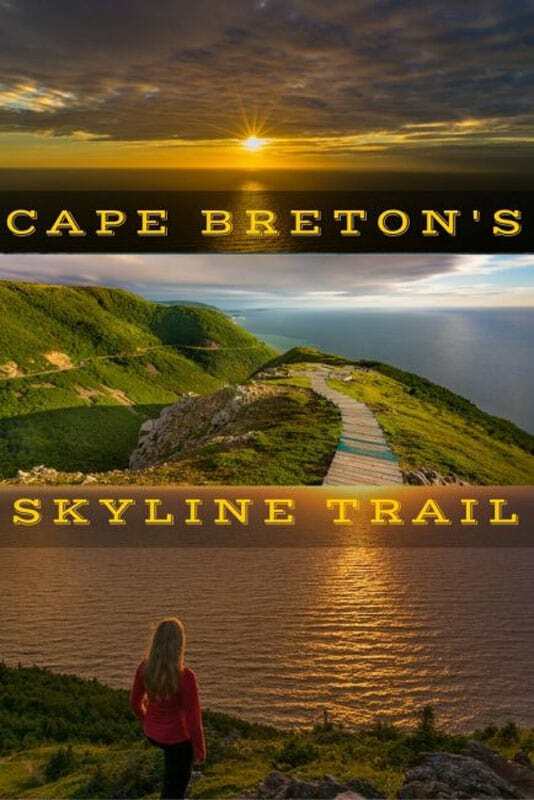 The Skyline Trail of Cape Breton is the most scenic hike on one of Canada's most scenic driving routes. 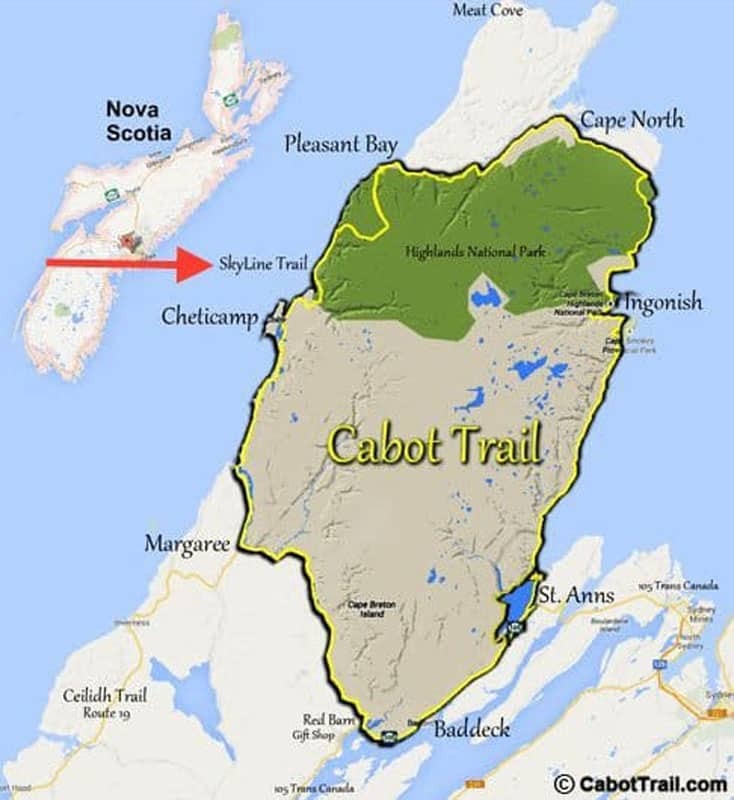 If you are planning on doing only one hike when driving around Nova Scotia's Cabot Trail this is the trail to do! If you are looking for the Skyline Trail, it is located between Pleasant Bay and Cheticamp on the North East side of Cape Breton Island. 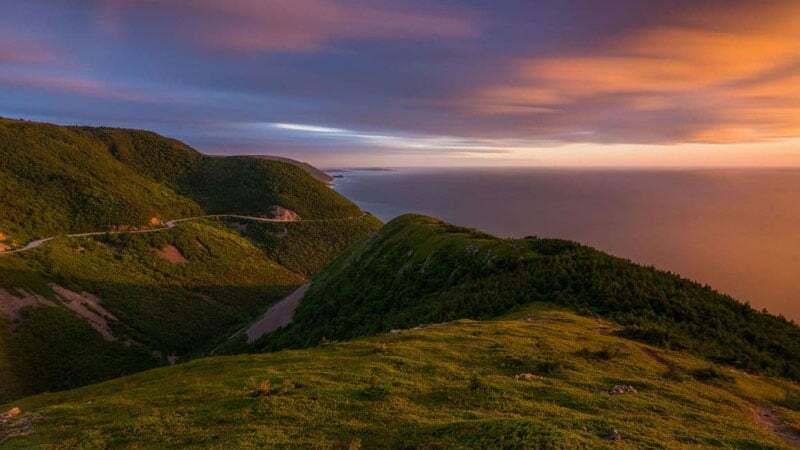 The Cabot Trail itself is a huge three to five-day scenic drive that is considered one of the best road trip destinations on earth. The drive alone is spectacular, but make sure to get out and hike too. 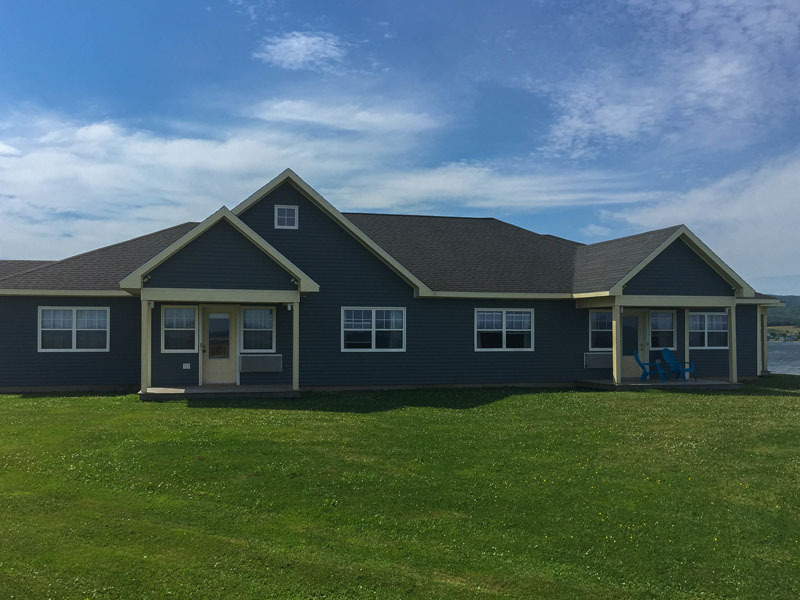 It is hoofing it on foot that will give you even better views of the Atlantic Ocean and the Gulf of Saint Lawrence. There are many hikes to choose from, and the Skyline Trail is a hike that is not to be missed. 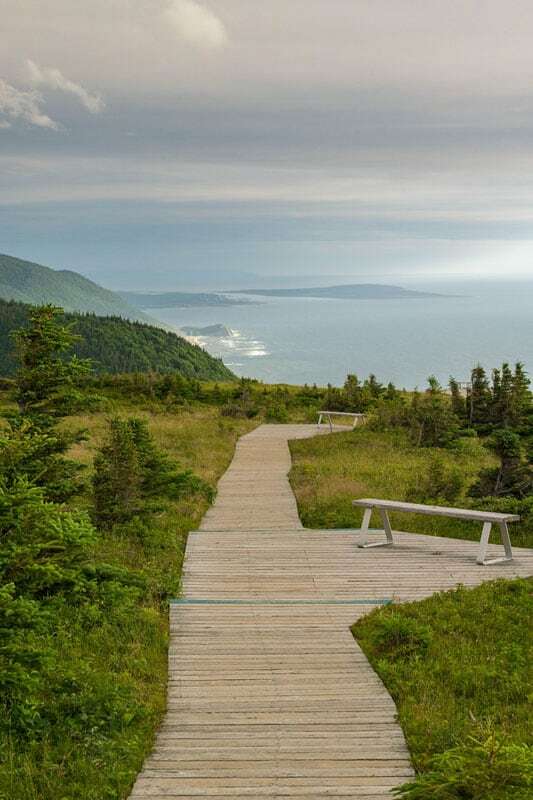 The Skyline Trail is the most popular hike on the Cabot Trail so crowds can be a problem, but we suggest getting around this inconvenience by hiking it early in the morning or at sunset like we did. 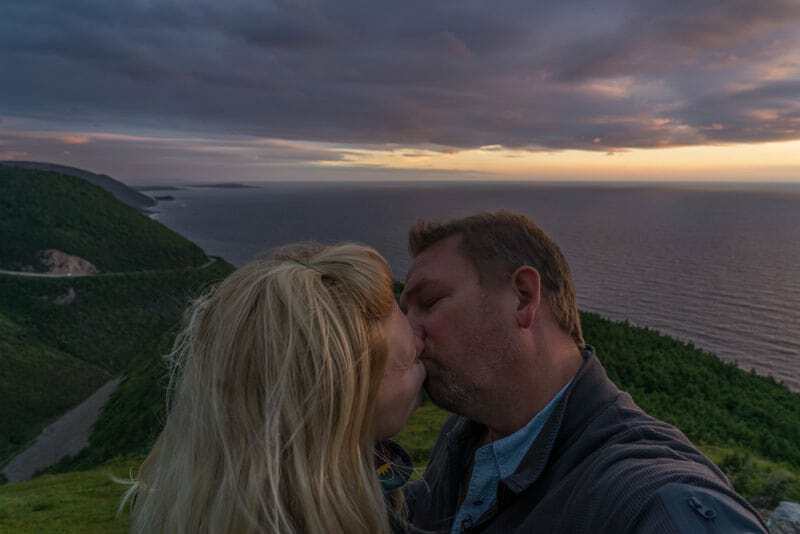 By staying nearby at the Island Sunset Inn at Margaree Harbour, we were free to take our time waiting for the sun to go down over the giant sea cliffs of the Cabot Trail. The Island Sunset Inn is an excellent base for exploring this side of the Cabot Trail. Their luxury seaside cottages make for a decadent stop over the many more rugged choices on the Cabot Trail. We especially enjoyed their Seaside Dining Room where we savoured locally caught lobster and crab trapped by our server's very own boyfriend himself! 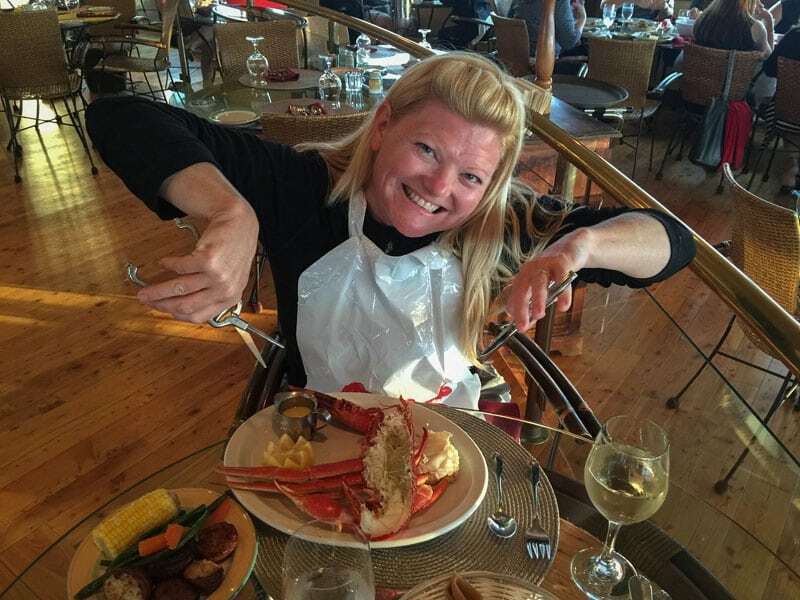 Deb digging into some lobster at the Island Sunset Inn before our hike on the Skyline Trail. I love the friendliness of Nova Scotian's. Our server explained that this catch came from a lobster boat that her boyfriend worked on and it was one of the last catches of the season. We then talked about life on Cape Breton and in Nova Scotia and how a lot of the culture still very much revolves around the fishing tradition. We set off after a short time relaxing at our cottage in the afternoon for the sunset evening hike. The beauty of driving the Cabot Trail in the summer is that the days are long and you can pack a lot of scenic stops into one day. For us, the sun didn't set until well after 9:00 pm, so we could take our time exploring the 7.5 km loop. The Skyline trail is well marked and an easy hike. It starts on a wide gravel road that is wide enough for park vehicles to drive before entering a well-groomed path cutting through evergreens. The Skyline Trail is an easy hike over well-maintained trails meandering through forests and shrublands set on a high plateau. The area is protected and you will even walk through a fenced-in stretch of shrubbery protected from moose trampling the fragile ecosystem. Enjoying a peaceful moment on the Skyline Trail. The trail has boardwalks set up here to keep people off the land to allow for regrowth in these areas but the boardwalk also makes it an easier walk on the stepper stretch of the trail. I would suggest giving 2 hours before sunset to hike out to the viewing point. 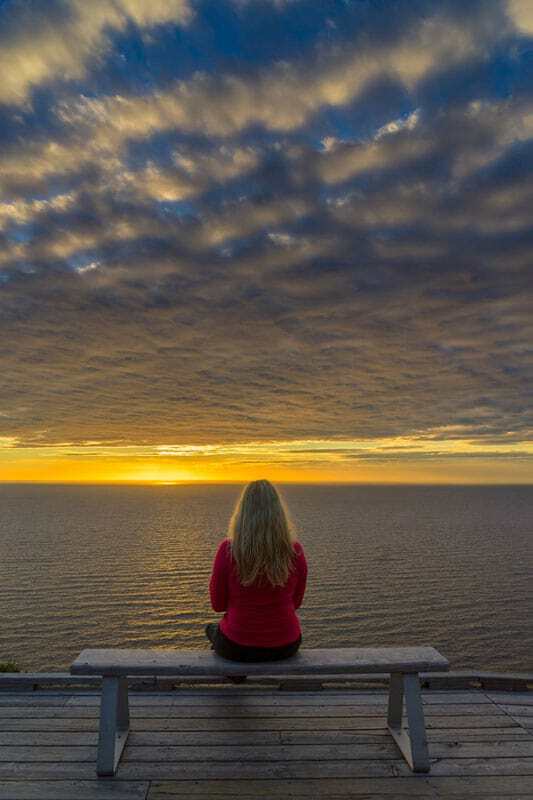 It can be done faster and if you only have a short time, an hour is very possible, but to truly take in the stop and to enjoy every viewpoint, two hours is plenty. Plus you'll be able to scout the best spot for watching the sun go down. The boardwalk leads down the steep headland cliff giving panoramic views of the famous winding road and the Gulf of Saint Lawrence. The Skyline Trail has a well maintained boardwalk as well. There were few people on the trail when we arrived. Most people were heading out. 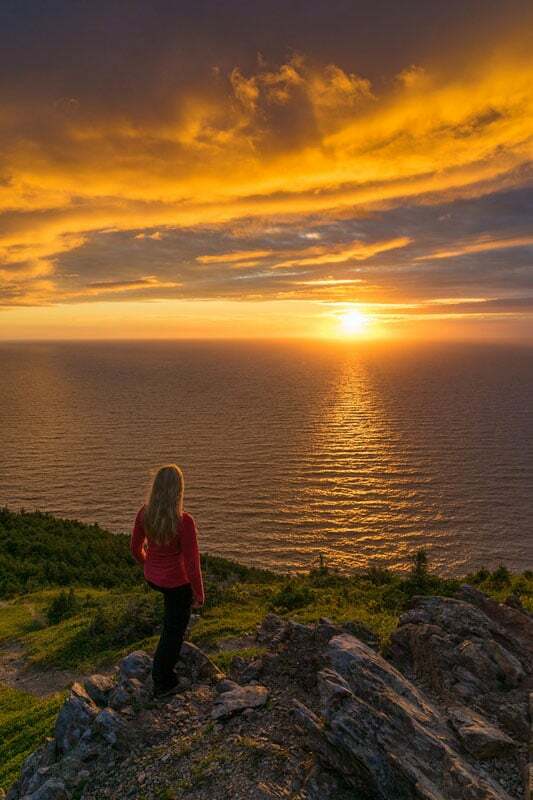 We drove the Cabot Trail in prime tourist season, but when doing the sunset hike, we had the lookout nearly all to ourselves. Park's Canada offers guided sunset walks if you are interested in learning more about the flora and fauna. There are moose and other wildlife on the trail and the group with Park's Canada that we talked with did manage to spot a moose and her cub in the bush. Dave and I missed seeing it and it was probably because we didn't have the trained eye of a park ranger. But, we were happy to arrive a solid half an hour before the tour group at the lookout, giving us views of the ever-changing light. Sunset from the Skyline Trail was magnificent. We didn't arrive just for sunset, we witnessed the golden glow of a rich setting sun over the rolling green landscape until we were treated to a spectacular display of orange and pink hues lighting up the sky. By the time the sun set there were about 20 people on the trail, but it never felt crowded. There are several different platforms on the boardwalk spread out along the top of the French Mountain. You can pick a spot on a wooden bench and watch in solitude as Mother Nature puts on her best display. We really enjoyed the Skyline Trail. If you really want to get away from the crowds, you can even walk farther down from the boardwalk to a dirt trail that leads far out to the end of the trailhead. We were quite content with our view capturing the roads cutting through the deep valleys and the high vantage point of the sunset over the water. Tonight, the sunset on the Skyline Trail did not disappoint. It was breathtaking. As everyone remained silent, we marvelled at the beauty of the Cabot Trail's most spectacular lookout. The Skyline Trail is not to be missed when visiting Nova Scotia. 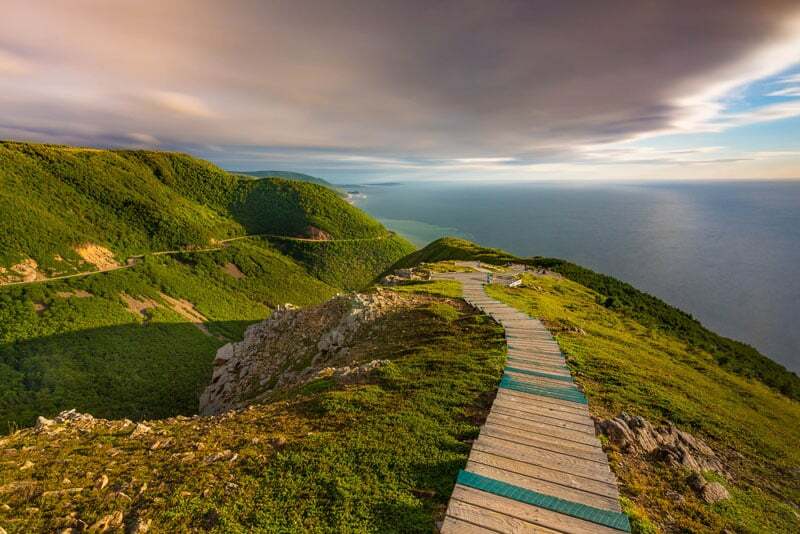 Welcome to the Skyline Trail of Cape Breton, Nova Scotia. Be sure to bring a flashlight or headlamp for the hike back. It can get very dark. As usual, Dave and I were one of the last ones off the trail. We waited for that final ray to go below the horizon before making our way back to the car. There's something about hiking in the dark that makes a person walk faster and we were back within an hour. Hiking boots or good sturdy shoes are a must. Even though the trail is easy, there is still some uneven terrain. Bugs can be brutal in Nova Scotia at this time of year, so bring insect repellant and wear long sleeve shirts and pants to protect from mosquito bites. Also, make sure to bring plenty of water. There aren't any vendors in the area, so be prepared. Even though it is a relatively easy hike, you still want to remain hydrated. And finally, keep an eye out for moose. Many people think moose are harmless, but if you do see them, give wildlife a wide berth. These moose may be used to people, but they are still wild animals and you are in their house. This is still a national park and the middle of nature. 22 Nova Scotia Pictures That Will Make You Want to Visit Right Now! 18 Responses to "Welcome to The Skyline Trail -The Most Scenic Hike on an Epic Drive"
Hi, Deb and Dave! Thank you for sharing your beautiful photos and experiences. My family and I will be walking the Skyline Trail later this summer. It seems that you walked the loop, rather than walking to the vantage point and then doubling back. If that’s the case, was the second half of the loop worth taking, especially if it offers different views and maybe a better chance to see wildlife? We’re trying to decide whether to take the loop (which is a longer route), or just double back to save some time. Thank you for your advice. I just came across through your website and I really find it amazing This post is so amazing. great way to get knowledge about this place with stunning pics. What a beautiful place! I would like to walk through that steps. It will be fantastic. Wow! Your photos are beautiful! Thanks for sharing.Just AMAZING place!!! Amazing Place.Thanks for the Sharing. Wow what a wonderful pics and cool place to spend a day! Thanks for sharing. I’m hoping to get there next year. Perfect article with getty images. really nice place. I will try to go there within next year. I love traveling. Wow! Your photos are gorgeous! Thank you for the tips and recommendations! Hi, Dave and Deb ! wow… the sunset view is amazing . Your post is very amazing as the way you are describing your words its amazing. I am also a traveler every time I am looking for a travel Idea. Finally one I got from here.Thank you so much for this post.Keep it up. This is nice collection of video and pictures to tell a story. I love it. Feeling like travelling and leave this very board environment. This is a very beautiful place. Well done shots & writing & video. This site is a big worth to me. Lots & lots of info on travel. Mind blown away! Thank you very much for sharing. What an awesome experience! Beautiful photos too. This really makes me want to get out do this! Wow!! Look at that sunset from afar. Same as you @Zach, I didn’t know if this view exists too. 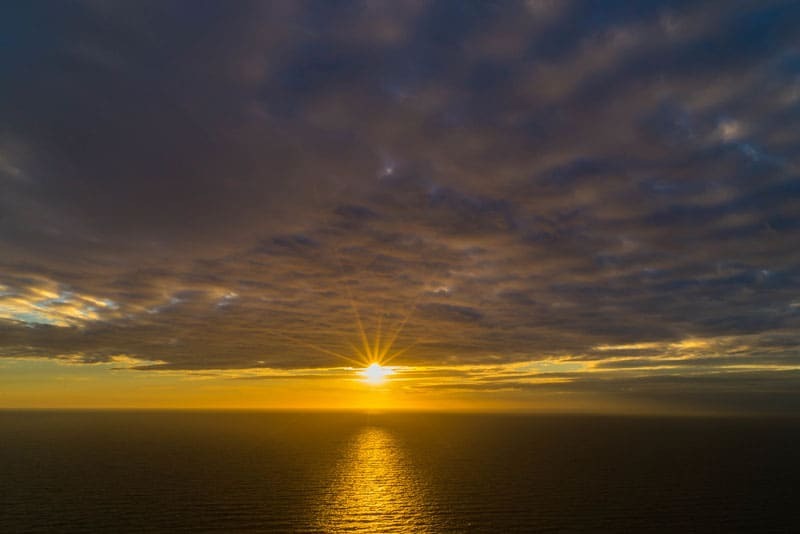 The seas shine brightly as the golden color of the sun. I wonder if somebody could sleep in skyline trail overnight. It would be great if somebody could, you know, to watch the morning dawn as well. Wow I didn’t know this existed. That is a gorgeous sunset.